4 How will I trade in seoclerk.? All trading from the WTT section is done through the on site inbox. 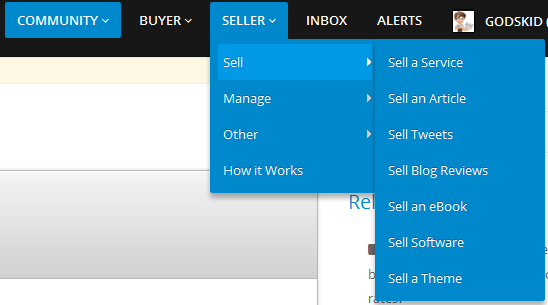 After signing into your account, you place your cursor on seller. You do'nt need to click, just place your cursor over it. From here you can now click on any type of service you want to offer or sell. When you click it, it will take you to where you put the description. But for now I will advise you to only use "Sell a Service". It is a lot easier to use and you can use that to under stand the rest. You can also view the services other people are selling to see how you can do yours too. If it is the "Want To Trade" you are interested in, all you need to do is tell people what you are offering and what you will like in return for what you are giving out. It is somehow like trade-by-barter where you give something and get something in return. you can trade in the seoclerks.you can create your own sell.here on the seoclerks have a option for sell service.you can create thair services and trade also. Where can I get list of prohibited items/services to trade on SEOclerks? What do you do if you select a trade and the person doesnt deliver their end? How will I trade in seoclerk.? Trade Skills Or Services Without The Use Of Money?